One 14 karat white gold enamel ring. 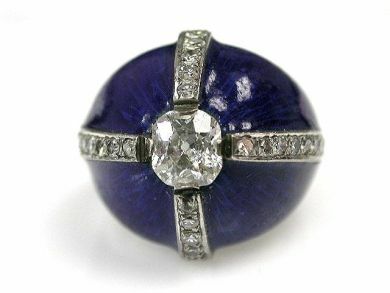 The navy blue enamel cross ring is set with one old mine cut diamond (1.00 carats: I1 clarity: I-J colour). Twenty-eight single cut diamonds (0.54 carats: VS clarity: I-J colour). Please make an appointment to see this item.